Normative information was extended upward to include ages 19-0 through 24-11. Co-normed with the TOSWRF-2 and TWS-5. Practice form administration time was decreased to one minute. Administration instructions were updated to expand the use of TOSWRF-2, particularly with deaf and hard-of-hearing students. 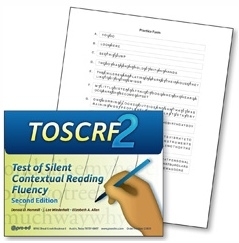 The TOSCRF-2 is a quick and accurate method of assessing the silent general reading ability of students ranging in age from 7 years 0 months to 24 years 11 months. It has a test manual and four equivalent forms (A, B, C, D). The TOSCRF-2 was normed using a national representative sample of 2,375 individuals, residing in 29 states. It yields raw scores, standard scores, percentiles, and age and grade equivalents. 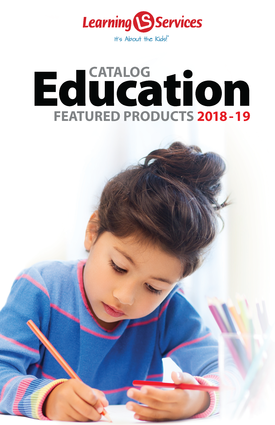 Classroom teachers, special education teachers, reading specialists, school psychologists, speech pathologists, or any other professionals with some training in standardized test administration can use the TOSCRF-2. COMPLETE TOSCRF-2 KIT INCLUDES: Examiner's Manual, 25 Student Record Forms A, 25 Student Record Forms B, 25 Student Record Forms C, 25 Student Record Forms D, all in a sturdy storage box.